When it turns cold, it’s good to warm up your body with a healthy warm tea. 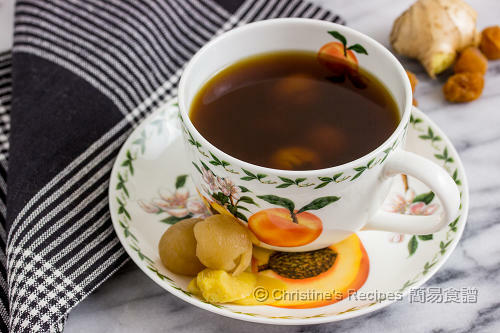 I especially like this simple Chinese ginger brown sugar drink. It tastes not too sweet with a touch of ginger taste. Ginger has a wide range of antioxidant properties as well as helps reduce digestive disorders. 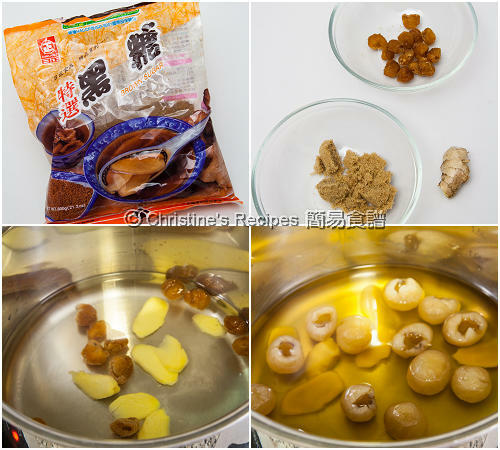 The extra ingredient I added, dried longan pulp, is good to calm your nerves and help you have a sound sleep. Not only does brown sugar sweeten your tea with a molasses flavour, it also gives you more minerals, like calcium, potassium and iron. In Chinese medicine, this tea can help relieve menstrual cramps. Rinse the ginger and slice. Rinse the longan pulp. Drain well. Use a heavy based pot. Pour in the water. Add ginger and longan. Cook over medium-high heat. Bring it to a boil. Reduce the heat and simmer for about 10 minutes, until the water reduced to 400 ml. Stir in brown sugar and cover. Turn off the heat. Don’t remove the lid. Let it stand for 20 minutes. Done. If the weather is too cold and the tea cools down, you might like to reheat it again. Serve warm. The amount of sugar can be adjusted to your liking. For the best results, try to get old ginger. You don’t need to peel off the skin. Dried longan pulp is available at Asian grocers. I feel instantly warm and good just reading the title :-) Definitely a perfect drink for those cold days. That's great. Glad that you liked it. Can I drink this everyday? Will it be too heaty? I don't recommend to drink it everyday. Too heaty. Might be weekly, but all depends on how your body reacts. Everyone is very different. Why is it better for the fresh ginger be old? Old ginger roots have got more nutrients. 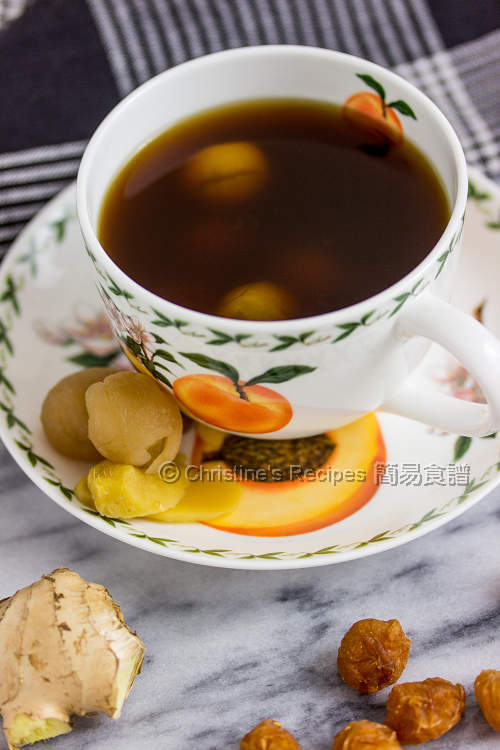 Traditionally, we use old ones for making this tea as they can help repel wind in our body.